Indian Railway is India’s third largest human transport system over which 2 corer passengers travel daily all over India. Even if there are seat available random people who don’t buy tickets enter the compartment and buy tickets from the Tc. This increase rushes in train which results “happy journey” slogan of Indian Railway in to “unhappy journey”. To manage this kind of problems Indian Railways have provided both online and offline reservation for its passengers. Railways have also introduced both tatkaal and normal reservation schemes which reduces the tension of last minute booking cancellations. This saves a lot of effort and money which become a boon for the waiting list passengers. The android application has made the technology and internet access much faster than unusual which books the tickets in an efficient way. For example an android app designed for managing waiting list passengers is explained below. In India Whenever the peak seasons take place more than half of the passengers having tickets of waiting suffer. These waiting list passengers accomplish their journey from their source station to destination in standing mode. The number of passengers in Indian Railway has been increasing drastically in every year, in a rate of 25 to 0 percent from its previous year. Such increase also increases the number of waiting list passengers in every train. The main objective of this app is to provide a dynamic seat allocation for waiting list passenger. To provide a dynamic seat allocation which is helps to Indian Railway in many ways. To optimize the seats by waiting list passengers. A new Seat Allocation system with advantage of QR system is proposed. QR code image that contains information about ticket. An Android application with RFID technology verifies QR code information with the database ensures availability of seats for waiting list passengers. 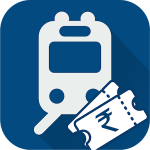 Not only this app, there are many more apps available for railway ticket booking in the internet.